When the Smoothwall’s instant messenger proxy or Guardian module are configured to intercept SSL traffic, certificates must be validated. This is done by checking them against the list of installed Certificate Authorities (CA). Your Smoothwall comes installed with open source certificates issued by well-known and trusted external Certificate Authorities. 1. Go to System > Certificates > Certificate authorities. 2. To review a specific certificate, click on its name. The certificate opens in a separate tab on the browser. 2. From the Import Certificate Authority certificate section, click Choose File. 3. Locate and open the relevant certificate. Note that this must be in PEM format. 4. Click Import CA certificate from PEM. The Smoothwall imports the certificate to the bottom of the list. 2. Locate and Mark the relevant certificate. 6. Save the certificate on suitable medium. 3. Click Restore deleted built-in CAs. 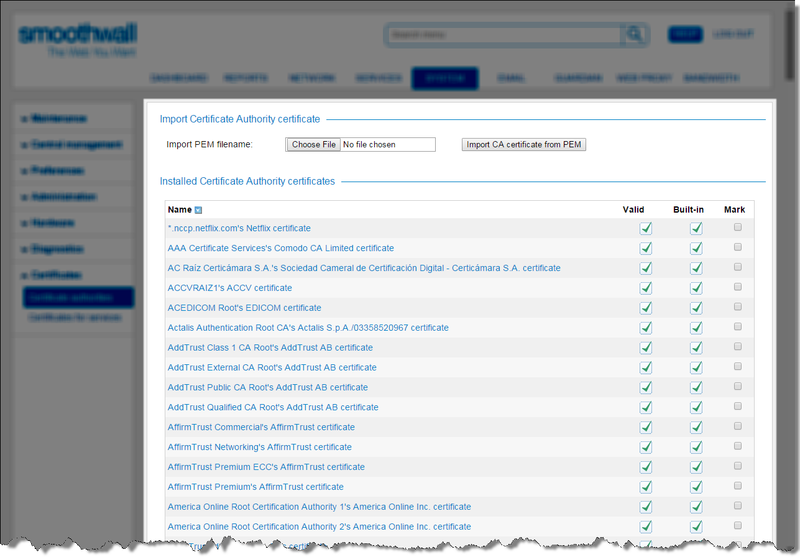 All previously deleted CA certificates are restored to their original location.